GOOD BITE: Fez Sepic and a mako shark he caught at Portland. Offshore was popular this week with the kingfish action heating up. Chris Pitman, of Trellys Geelong, ventured out off Point Lonsdale in 15-20m of water around the reef and managed kingfish to just under legal size and salmon to 2.5kg, while casting 7inch Gulp Jerk shads. There have been other reports of kingfish over 10kg caught by jigging in the rip and down rigging live slimy mackerel and squid. 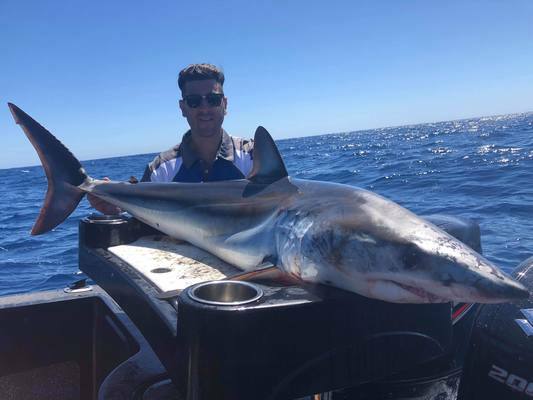 Fez Sepic and his mates fished off Portland and caught a mako shark of about 40kg and a couple of blue fin tuna about the 45kg mark. The tuna were caught on a six-inch lumo skirt trolled in around 20m. Bottom bashing offshore anywhere from Torquay to Barwon heads in 30-50m has produced gummy shark averaging about 8kg, fresh salmon fillets and squid make ideal baits and will also work on the snapper about 2kg and tiger flathead that are also being caught in the same water. Corio Bay is still producing a good number of pinkes for bait and soft plastic anglers. The Alcoa spoil grounds and the nearby pier have been one of the better areas to focus on with pinkies to around 50cm, flathead and good numbers of pike on offer. Whiting have fired from Clifton Springs to Queenscliff with reports of some anglers having no dramas filling their bag limit. Best results have come while fishing a moving tide at evening in around five to six meters using pippie and squid as bait. Barwon River estuary at Barwon Heads has been a great location to take kids fishing lately with many small species on offer to keep them entertained. Casting only a few meters out from the bank with a size 4 long shank hook and pippie or prawn for bait will have you in with a chance of a small salmon, Tommy Ruff, whiting or trevally. Further upstream the fresh water parts of Barwon River have seen carp to 5kg banked on bread or corn as bait and good numbers of redfin taken on small soft plastics.